Japan led the falls, losing almost 10.5%, followed by the US, where shares fell by more than 9%; their worst December performance since 1931, driven by the Fed rate rise, weak oil and tech stocks and concerns over the Sino-US trade dispute. Having been a poor performer for several months, the UK equity market saw more modest losses than other major markets, as the Brexit saga continued. Mrs May survived a vote of no-confidence from within her own party, and headed off suggestions of a challenge from Jeremy Corbyn. There was a concerted effort to sell the Brexit agreement to MPs ahead of the parliamentary vote on 15th January. Political uncertainty and faltering economic data, saw EU shares fall across almost all markets in December. Most of the EU markets were lower at the end of the month, with the southern nations broadly performing better than France and Germany, which fell by 4.6% and 5.7% respectively in Sterling terms. Government bonds saw a fall in yields, as investors looked to a safe haven to weather out the year-end storm in equities. Oil shares, which feature in many income portfolios, continued to lead equity markets lower in December, with falls of up to 16% in major producers. The price of WTI (West Texas Intermediate), a major oil benchmark, saw a brief rally from the $50 level, but ended the year just above $45 – its lowest level for eighteen months. Japanese markets fell along with other developed markets in December, declining 10.2% when measured in Yen-terms. 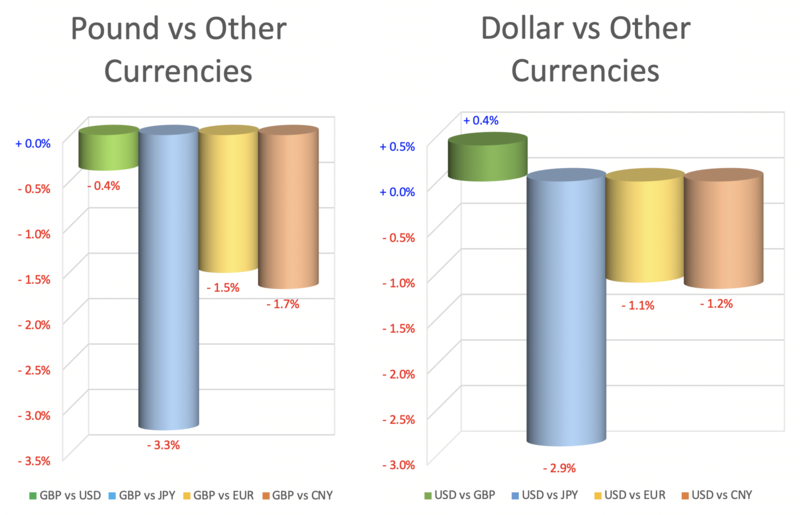 However, losses for unhedged investors were mitigated by a notable rally in the Yen, which often functions as a safe haven currency, amid risk-off sentiment. The Yen rose over 3.0% against both Sterling and the US Dollar. 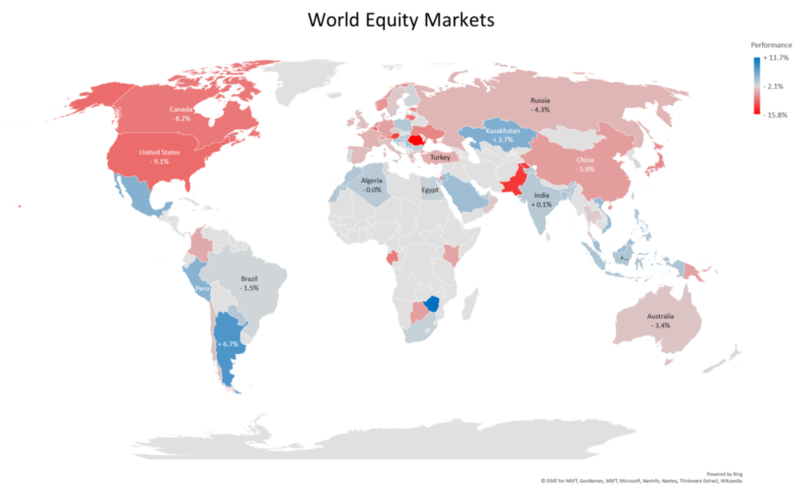 Whilst December was a poor month for equity investors, the emerging markets were generally a slightly better place to be that the developed markets. Emerging market equities, having been battered throughout much of 2018, were a relative safe haven in December. The MSCI Emerging Markets Index fell only 2.5%, in GBP-terms, as global markets fell 7.0% (as measured by the FTSE World in GBP-terms). Emerging markets appear to have been supported by more dovish language from the Federal Reserve after its December meeting, as well as signs of reconciliation in the Trade War, following a meeting between Trump and Xi at the G20 conference. Performances across the EU nations were almost universally negative, though a handful of the more southerly members did post small gains. 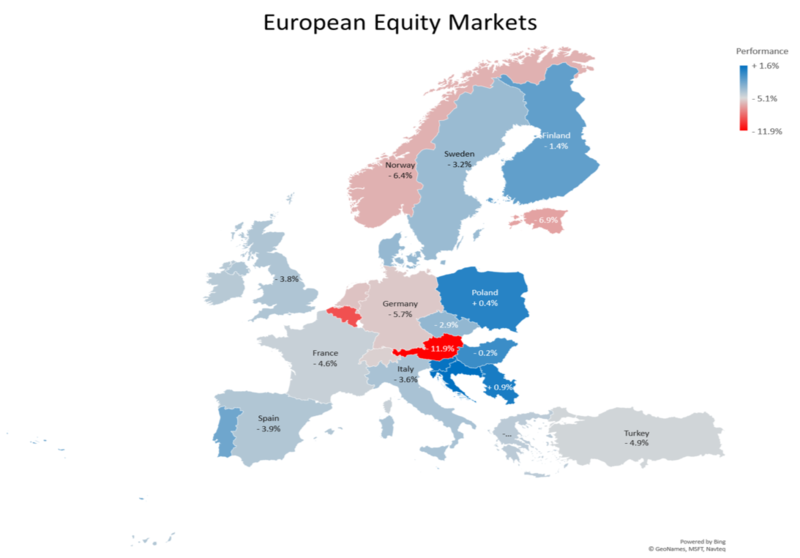 Slovenian equities rose by 1.4%, and gave the best return in the EU, whilst Austria was the worst performer, losing 11.9%. The major markets were generally poor, as were the Nordics. Political concerns, weakening economic data and increasing criticism of the EU’s approach to Brexit all served to undermine confidence in equities, and European government bonds were commensurately buoyed as investors sought safety. The Sterling exchange rate against the Dollar was virtually unchanged during December, whilst both currencies lost ground against the Euro, Yen and Chinese Yuan. Many economists setting out their 2019 forecasts predicted a weaker Dollar, and the movement in December appeared to suggest investors positioning themselves accordingly, rather than any immediate reason for short-term strength in other currencies. The Pound was volatile during the month, as the Brexit news ebbed and flowed, and it touched $1.25 – its lowest level since the triggering of Article 50 in Spring 2017, but closed the month around $1.27. The move into European bonds continued in December, with most bond yields contracting, the notable exceptions being France and Greece. Overall, however, bonds were preferred over equities. Sharp falls were seen in the yields of US and UK bonds, despite the Fed raising rates, leading to some small further flattening of the US yield curve. With no prospect of an early rate rise in the UK, gilts were a natural home for nervous investors seeking shelter from the equity market turmoil. There was no sign of a ‘Santa Claus rally’ at the end of 2018, and December saw falls across all the major markets. In fact, there were relatively few stock markets across the globe that managed to record a positive return on the month, and the US market in particular suffered its worst December fall since 1931, at the start of the Great Depression. 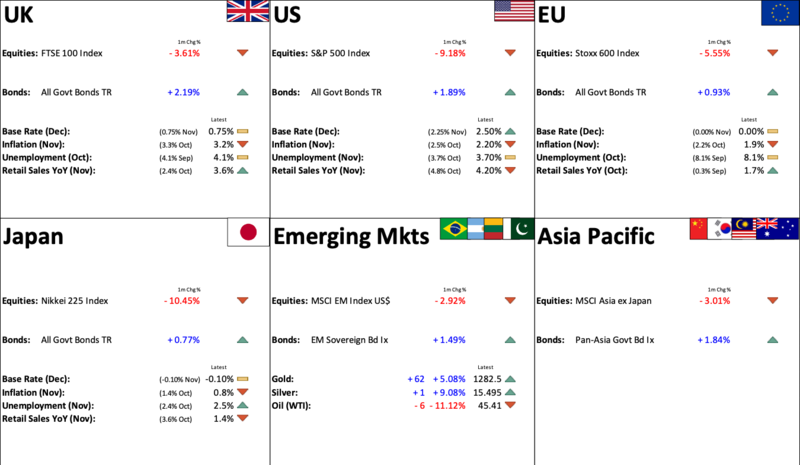 With political uncertainty in the EU, Brexit, the Sino-US trade dispute, and the economic slowdown being seen in Europe and China, there was little good news to cheer the market. In addition, there were a number of ‘events’ for the market to address: The Fed raised its target rate as was widely expected, but neither the markets, nor President Trump seemed happy with this, the US Defence Secretary, James Mattis, resigned over policy differences with the President, and weaker economic data was reported for the Summer period, though the data still points towards a reasonable 2019. However, the thin market reacted strongly to these concerns, and the pick-up in volatility that appeared at the end of last year was in stark contrast to the low levels of volatility that we had grown accustomed to up until Spring 2018. It should be noted however, that the period of low volatility seen in 2017 was anomalous, and, as the charts below show, market volatility is, in most cases, still only at or below its average of the past 20 years. Part of the reason for this increase in volatility is that the issues that are worrying investors are not ones that have a clear outcome. In most uncertain situations, there is at least some market consensus on the likely result, and there is a date when the matter will be resolved. However. whilst nothing has fundamentally changed in the world over the past month, the nature of the imponderables mentioned above, Brexit, trade wars etc. is such that there is not only no consensus, but there is not even a date in the future when these issues will be resolved. The result is that share prices react to every scrap of news that is released, or indeed rumoured. We ended 2018 in the middle of a number of negotiations that do not have a clear path to resolution. The UK is in limbo, with the crucial parliamentary vote on the Brexit deal not due to take place until 15th January, and no road map to suggest where things may go after that. The current circumstances have left UK equities looking cheap in both an historical and global context, and we are looking to take advantage of this in our flexible approach to the UK market. The US government shutdown in itself is nothing new – indeed, it has become a regular occurrence, but this time the sticking point is over building President Trump’s wall to the south. This is an entirely infeasible project, but there seems to be no sign of either side backing down, and little room for compromise. Similarly, there is currently a 90-day truce between the US and China over trade tariffs, with China set to host talks in early January, but the outcome remains uncertain for US and Chinese companies. The arrest, in December, of Meng Wanzhou, CFO of the Chinese technology company, Huawei, seems to have polarised public opinion, as other Chinese firms have shown support for Huawei, and even US economists have criticised the arrest and questioned the motives behind it. In the EU there continue to be a number of political stressors: There is tension between the EU and Hungary over President Viktor Orban, who appears openly to flout EU rules on free movement of people, with razor wire and water canon on Hungary’s borders, Italy’s new populist government has fallen foul of the EU Commission with its proposed budget, France continues to experience rioting on the streets of Paris, and the German Chancellor, Angela Merkel, is seeing support for her party fall away, even as the coalition that has kept her in power is itself showing increasing signs of stress. December is a month when trading volumes are traditionally thin, with many participants on holiday, or else tidying up their paperwork for the year. In times of such thin trading, we would naturally expect volatility to be elevated, since, in a thin market, it does not take much to move share prices. This, combined with the factors outlined above, makes it easy to understand why markets ended 2018 on an uncertain note; stock markets, as we are constantly reminded, fear uncertainty more than a known adverse outcome. What we can say however, is that the problems that the market is now focusing on will be resolved at some point. We remain confident that global markets continue to present opportunities for profitable investment, with shares, particularly in the UK, looking historically cheap, and, in the case of the UK, offering high-quality dividend yields. 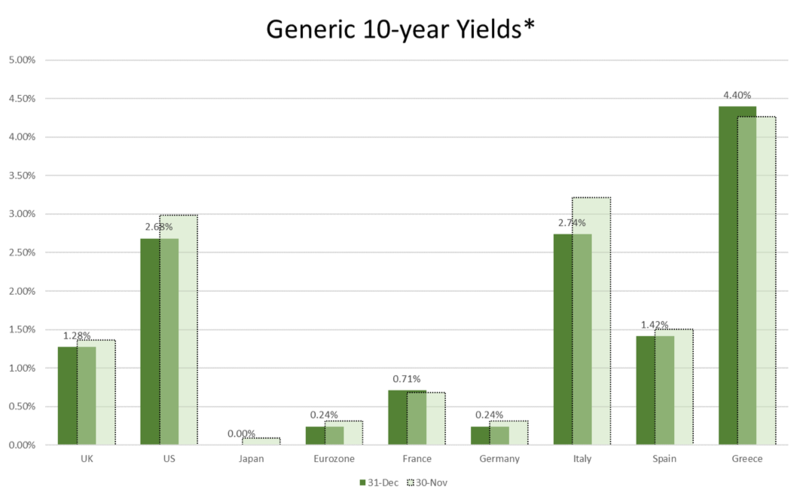 Benchmark rates around the world remain low, offering little incentive for investors to leave cash on the sidelines as equities in many markets offer a considerably higher yield. In the UK, the difference between dividend yields and bond yields is at its highest level since the early 1990s. Whilst economic growth in the EU and China has shown signs of flagging, data coming from the US remains robust, as does confidence in the Trump administration. We look to the underlying economic outlook for the major markets, rather than the day-to-day ‘noise’ that is being produced by external factors. We therefore consider the current volatility as an opportunity, rather than a harbinger of doom.